In a place where dreams are lived out and memories built. All in complete serenity and beauty touched by local African warmth and charm. Experience unique moments of adventure and relaxation. Wake up to the rising sun and sound of the Indian ocean from the living room or your bed with breath taking 180-degree sea views. Watch the Dolphins and Whales sometimes freely play from the balcony. 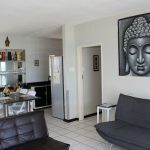 Silver Dolphin Holidays is situated in the coastal town of Amanzimtoti where a warm welcome is extended to both local and international holiday makers. We are just 35 minutes away from King Shaka International Airport, right on the beach! 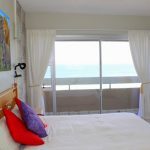 This bold and chic 7 sleeper self-catering beach apartment situated on the 7th floor. Rooms are styled in beautiful modern Balinese themes. The unit is equipped with all self-catering facilities and viewing entertainment. FREE-WIFI is offered to always stay globally connected. Everything from restaurants, beach picnics, canoeing to shopping malls and various entertainment is within walking distance. The apartment is disabled friendly and has all the modern facilities of a home away from home. Certificate of Excellence – 2017-2018. Rated 9.4 by Booking.com.